Reduce the appearance and inflammation of active spots with intense pulsed light treatments. 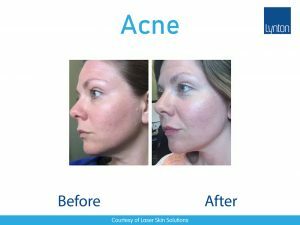 Acne can be an embarrassing problem to cope with. We can reduce it by up to 40% over 6 weeks. 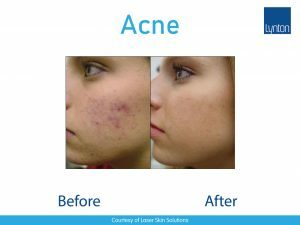 We can reduce your acne within 6-8 weeks of regular treatment. 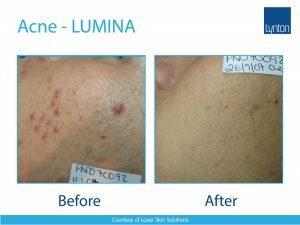 Using intense pulsed light the overactive sebaceous glands of the skin are treated to reduce the active number of lesions visible. Light energy is applied to the skin there are overactive sebaceous glands. The treatment reduces the number of lesions and inflammation. A layer of chilled gel is applied to the skin to guide the light. The light is placed on the skin and a short pulse is released. Each pulse treats a large area of skin. Fairer skin may have a slightly better result, but treatment is available for most people. If you are taking Roaccutane (acne medication) you may not be suitable. The area may well feel warm after treatment, and quite red, and cheeks can be delicate. There may be some redness up to 48 hours after treatment. Occasionally a small blister may develop. Usually 6-10 Treatments of pulsed light and exfoliation. For more difficult treatments, a longer course may be needed. Will there be any pain during treatment? There may be very mild discomfort, but no pain should be felt during treatment. You will be consulted fully prior to the treatment to check your medical history. Let’s start your laser journey today. We’ve completed hundreds of cases of skin and hair treatments on patients just like you. We pride ourselves on exemplary patient after-care and support. With a backing of over 23 years of technological expertise via the Lynton Group who manufacture a range of aesthetic technologies, we can provide industry standard quality, safety and clinical expertise to our clients. We only use trusted brands. Lynton Products are approved by the NHS and are currently in active use across UK Hospitals.